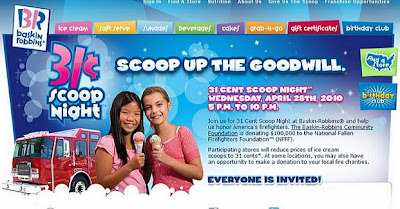 Today, 4/28/10, is the annual Baskin-Robbins 31 Cent Scoop Night. 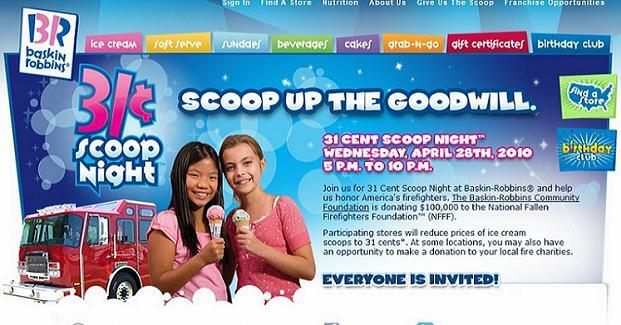 It starts at 5PM-10PM at participating locations. The Baskin-Robbins Community Foundation is donating $100,000 to the National Fallen Firefighters Foundation. Come join in the fun and help honor/support the cause. Another new thing that I happened to stumble upon was The Coffee Bean's new deal. They are offering a Complimentary Espresso Shot with Purchase of Any Hot Coffee Beverage from Monday-Friday after 4PM and All Day Saturday & Sunday. I saw this banner at the Santa Ana location across from Main Place Mall, so I am not sure if it is every single Coffee Bean or just that location. If I happen to pass by another store that has the same promo, I will be sure to post updates in the comment section to let everyone know.